hair stylist, electronics genius, and authority on Easter. 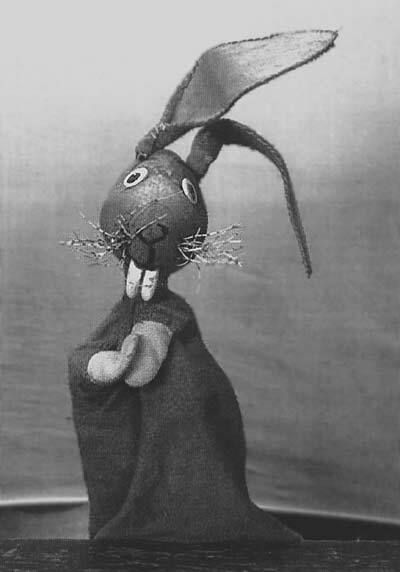 We flip a starched ear in salute to Fletcher Rabbit, the Kuklapolitans' anchor to sanity. Raising a garden means plenty of hard work. You have to get in there and dig dig dig. You may notice the double meaning there. E.B. (Easter Bunny) now is campaigning to have all rabbits grow their own carrots, so there will be no necessity to, ah, borrow carrots from amateurs' gardens. Frankly, I have always found suburban carrots to be rather woody. Texas grown carrots, sold in most chain stores, have good solid cores and an excellent flavor. The price seems to be within reason. A pond in the garden may be used for goldfish, but guppies are considered more practical. I hope that answers all your questions about gardens.